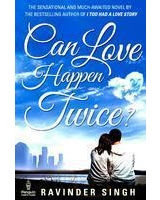 Is Cover Page and Name of "Can Love Happen Twice" Copied ? 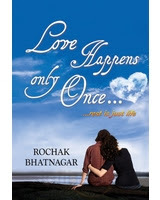 What we noticed that the cover page of Ravinder Singh's Book "Can Love Happen Twice" matches in some sense to the cover page design of Rochak Bhatnagar's Book "Love Happens Only Once...Rest Is Just Life". Yes Did you notice the Similarity in the Names of Two Books, Yes..!!! They both significantly describes the same meaning and now you have a clear look on their Cover Page, which is somewhat same to each other. What do you have to say Friends about the similarity in the name and the Cover page of both these books. As we know all Ravinder Singh's book got more fame than Rochak's Book, but still think and carefully analyse the similarity in both the two books.Though after reading, I assure you that that story plot of both the books are different, Both teach you the meaning of love in different sense. Well so, please all readers do comment to let us know your view regarding this matter...!! !